The red variety Pinot Noir is definitely one of the wine world's pork-pairing champions. When pork dishes are more heavily seasoned, one style of Pinot Noir stands out. Nothing so appetizingly portends the arrival of the Chinese New Year holiday as the sweet and pungent aromas of traditional holiday dishes. On the cusp of the Year of the Pig, today’s iDeal cover story appropriately explores the myriad of popular holiday pork dishes. The good news is that almost all these dishes have synergistic wine cohorts. But before we delve into wine partners, let’s look back at the long and delicious story of pork. The longer I study the history of food and also wine, the less consensus I find. This is also true of pork. There seems to be a general scientific consensus that a primitive ancestor of the Suidae genus to which the pigs belong appeared during the post dinosaur Tertiary Era when mammals began to diversify at a greatly accelerated rate. Our earliest Homo Sapiens ancestors certainly ate wild pigs but epicurean historians are split over exactly where and when the first pigs were domesticated. Most studies indicate Southeast Asia, China or perhaps the Near East as the areas where pigs most likely were first domesticated around 10,000 years ago. Consensus does exist that pigs are the second earliest beast to be domesticated after the dog. Domestication of the pig allowed for greater amounts of pork to be consumed and a new delectable age of pork dishes had begun. Preserved meats including dry cured hams came later and their point of origin is in similar dispute but China was certainly one of the earliest cultures, if not the earliest, to preserve pork by salting, curing and smoking. With many centuries spent refining the process of making dry cured hams these culinary treasures are now an integral part of Chinese epicurean experience, especially during the Spring Festival holiday. Pork is an extremely wine-friendly meat. Depending on the preparation technique and seasonings, light- to full-bodied sparkling, white and red wines are all fine partners. Fatty cuts of pork benefit from acidic white and red or tannic red wines as these qualities cut through the fat, cleanse the palate and facilitate digestion. The red variety Pinot Noir sports all these attributes and is definitely one of the wine world’s pork-pairing champions. When pork dishes are more heavily seasoned, one style of Pinot Noir stands out. Pinot Noir is New Zealand’s second most planted variety following the ubiquitous Sauvignon Blanc that brought New Zealand winemaking to global prominence. The internationally famous Marlborough region on the northern tip of South Island is the largest New Zealand producer of Sauvignon Blanc but there exists a smaller, lesser-known region that has made a prominent name for itself producing world-class Pinots. Around 15-20 years ago, the Pinot Noir wines of Central Otago burst on the wine scene. These robust and expressive reds were suddenly garnering gold medals at international wine competitions and receiving rave reviews from noted wine critics. Today, some wine experts even claim that outside of Burgundy the best Pinot Noir wines are being made in Central Otago. But the tiny Kiwi region of Martinborough in the south of Northern Island and Oregon State are also as regions that may lay claim to producing the best New World Pinots. Both New Zealand and Chile claim to have the world’s most southern wine region. 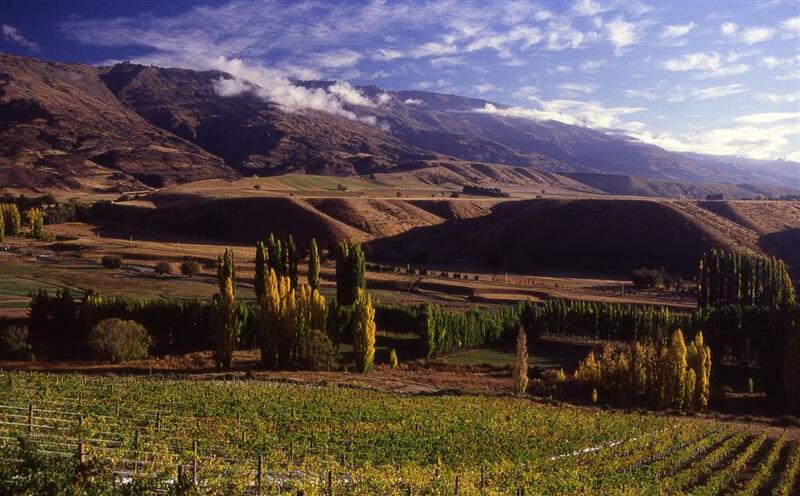 For the Kiwis, it’s Central Otago situated near the southern tip of South Island. This geographically extreme region, not surprisingly, has one of the wine world’s most extreme climates. Only the most fearless of winemakers brave the extreme diurnal temperatures and wild weather of this elevated continental climate. When Mother Nature behaves, the result can be deliciously animated and structured Pinot Noir wines. Pinots from Central Otago tend to be richly fruity, fresh with solid tannins, qualities that perfectly complement many Chinese pork dishes. Some of my favorite pork dishes to accompany these Kiwi Pinots are Shanghai-style red sauce braised pork belly, pork hock and lion’s head meatballs, Cantonese-style BBQ pork, sweet and sour pork and roasted suckling pig, as well as all kinds of dishes flavored with the famous Jinghua ham from Jinhua City of Zhejiang Province. Two pork dishes I’m especially fond of pairing with Central Otago Pinots are sautéed pig liver and stewed pig’s foot. In both cases, the richness of the meat is perfectly mirrored by the richness of the wines, while the combination of structured tannins and good acidity in the wines accentuate the original meat flavors and refreshingly cleanse the palate of any residual greasiness. Over the past decade an increasing number of excellent examples of Central Otago Pinots are finding their way to the Shanghai market. One of my favorites is Rippon, an estate managed by Joe and Nick Mills who collectively have extensive experience making wines at some of Burgundy’s most famous Domaines, including Romanee-Conti, Nicolas Potel, Albert Mann and Aubert de Villaine. Three of their wonderful red wines are available in Shanghai, the Mature Vine Pinot Noir, Emma’s Block Mature Vine Pinot Noir and Tinker’s Field Pinot Noir. All three are intense, textured and elegant New World Pinots. Another top Central Otago producer is Felton Road. Their Bannockburn, Calvert, Block 3 and Block 5 Pinots are less overtly fruity than many Kiwi reds but more balanced with good acidic and tannic backbones.